In 2016, Maurizio Sarri memorably said: “If I saw my team defending and counter-attacking after 30 minutes, I would get up and return to the bank because I would not be having fun.” It’s music to the ears of fans of the beautiful game – especially Chelsea fans disillusioned with Antonio Conte’s defensive approach, derided as anti-football in some quarters. There’s a reason you probably hadn’t heard of Maurizio Sarri until a few years ago. The bespectacled, smoking Italian would not arrive with the same reputation as Luis Enrique or Carlo Ancelotti. Notoriously shunning television interviews and refusing to fit the typecast of the modern manager, Sarri always puts substance over style. “Usually getting an award doesn’t give me particular satisfaction, I often consider it as time taken away from my work,” said the appreciative tactician after beating title-winning Max Allegri to the Panchina d’Oro (Golden Bench) in 2015/16. His career path could not be more different from other candidates for the Chelsea job. He has neither the trophies of Enrique, Ancelotti or Leonardo Jardim, or the major-club experience of Thomas Tuchel. Sarri’s journey to the top of Italian football and the hipster’s choice is unique. Of course, just working for Empoli and Napoli and doesn’t qualify you to work for Chelsea, but it’s important to understand why Sarri’s never lifted a notable trophy. His entire three-year big-club career has been in the shadow of Juventus’ Italian hegemony. His CV needs to be inspected more closely. Aurelio De Laurentiis’ appointment of Sarri at Napoli was met with more than scepticism, the god of Naples Diego Maradona quipping he’d “struggle to finish mid-table”. Not for the first time he got it wrong, apologised and dubbed Sarri his heir. But his work at Empoli was noticed by the experts. Legendary Italian coach Arrigo Sacchi told then Milan owner Silvio Berlusconi, “If you want to repeat with Milan what happened with me 25 years ago, I will give you a name. It won’t cost you money, but he is the coach you need.” It was rejected advice, which Berlusconi lived to regret, as he saw ‘Sarri-ball’ take full effect in Naples. Jorginho is Sarri’s Xavi, the embodiment of his vision, dictating Sarri-ball from the heart of the team. His extraordinary stats quantify Sarri’s football. Jorginho holds nine of Serie A’s top 10 single-game passing records. These are not passes for the sake of passing, Sarri and Jorginho are always forward thinking, as illustrated by WhoScored. Sarri is a coach in the purest form. Asked on arrival at Napoli who he would buy to improve a defence which had conceded more goals than anyone in Serie A’s top half, he explained that any issues would be corrected on the training pitch. Over the next two years, Napoli had the second best defensive record in the league, behind only Juventus. The perfect example is Kalidou Koulibaly, who was deemed by many as simply not good enough for Napoli; error-prone and lacking the ability to play Sarri’s fast-passing style. True to his word, Sarri and his team spent hours on the training ground instead of seeking a replacement, and the Senegalese defender is now one of the most impressive and in-demand centre-backs in Europe. Chelsea themselves had a £58m bid rejected in 2016 according to De Laurentiis and the links are still alive in 2018. Why buy the product when you can hire the inventor? Koulibaly credits his “genius” coach with turning him into a totally different player with a “new vision of football.” This is just a microcosm of Sarri’s coaching, Faouzi Ghoulam has become one of the best left-backs in Europe, while Elseid Hysaj, who followed Sarri from Empoli, is now courted by the likes of Manchester United and Liverpool. “Sarri taught me football” Mertens also eulogised. Once playing second fiddle to Lorenzo Insigne on Napoli’s flank, the Belgian was converted into one of the world’s best strikers in his late-20s, notching 34 goals in one season. Insigne was no elite winger either; jeered by his own fans and delivering five Serie A goals in his two seasons under Rafa Benítez, he then produced 40 in his opening two under Sarri. It’s not just individual performances that need lifting at Chelsea. The players seriously need a confidence boost after a season of Antonio Conte’s relentless criticism. Constantly telling the players they will “suffer” at the hands of opponents and that more signings are needed to compete undoubtedly weakens his players. 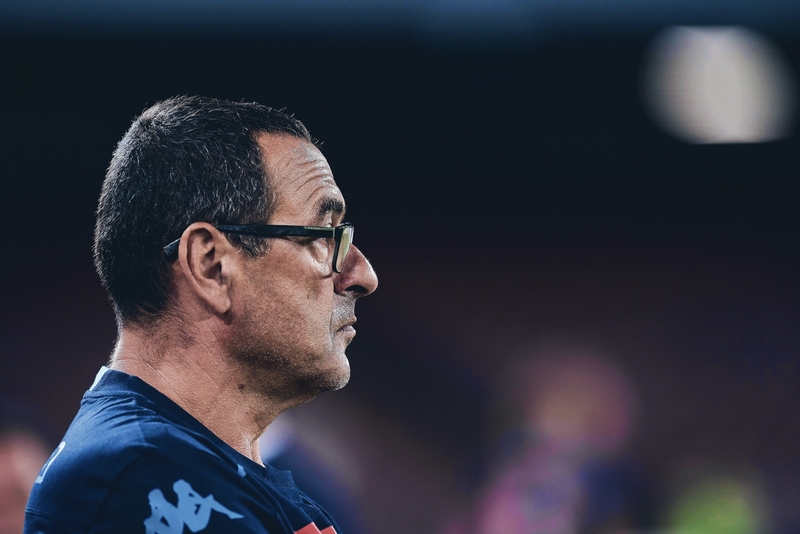 Sacchi explained how Sarri’s positive football ‘lifts the value of the players and their self-confidence’. In fact, a trait which will no doubt attract the Chelsea board is Sarri’s notorious dislike of the transfer market, once describing it as the “refuge for weak coaches”. The prospect of delivering signings for a coach to work with, rather than him meddling in the selection process, will suit the club perfectly. Chelsea are expected to hire a Director of Football and Lille’s Luís Campos and PSV’s Marcel Brands have been mentioned as options. This position above Sarri will need to be filled by someone with a football background to ensure he’s not given squad of Ross Barkleys and Danny Drinkwaters. Millions have been wasted on such players, while the talent of Chelsea’s prodigious academy and greatest asset has been similarly squandered. Would Sarri finally be the coach to seriously promote Chelsea’s forever-wasted youth prospects? He has not had the opportunity to with young players of the quality of Chelsea’s; Napoli’s Primavera hasn’t reached Italy’s playoff-style finals since 2012/13, when they lost in the first round to Chievo. Looking back to Sarri’s Empoli days, though, it is clear to see he trusts young players with significant roles. In his two seasons in Serie B – reaching the promotion playoff final, then winning automatic promotion – at least 10 players 22 or under played significant roles. Twenty-one-year-old Vasco Regini was ever present in season one before moving to Sampdoria. This was also the aforementioned Hysaj’s breakout year, among others. In 2013/14, when promotion was accomplished, Sarri’s star defender was 19-year-old Daniele Rugani, now of Juventus and an Italy international. Other successful young players who played significant roles that year were Simone Verdi aged 20, now an Italian international valued at €24m, and Mário Rui. Piotr Zielinski, also just 20, Hysaj, Rugani and Rui were all key players in Empoli’s successful Serie A survival season. “At Empoli, youngsters grow as a result of their mistakes”, said Maurizio Sarri. A far cry from Chelsea’s recent efforts. While there have been no notable breakthroughs from Napoli’s academy under Sarri, there have been opportunities for three young players in particular. Zielinski – who arrived from Empoli a year after Sarri – made 36 Serie A appearances last season. Marko Rog played 19 games and has already bettered that this campaign, while Amadou Diawara rotates with Jorginho at the base of midfield, playing 28 games in all competitions in 2016/17. Chelsea wouldn’t actually be the first time Sarri replaced a fired Conte, it happened at Arezzo in 2007, before Conte returned five months later. Such is Italian football. His career has had highs and lows, he’s learned from the depths of amateur football, and helped Gonzalo Higuaín have the best goalscoring season Serie A’s ever seen. There’s probably never been a better time to export Sarri-ball to the Premier League. Even the world’s top coach, Pep Guardiola, was told his Barcelona style would not work in England. By running away with the title this year and making José Mourinho’s Manchester United look totally out of fashion, he’s fostered the perfect opportunity for more to follow suit. Chelsea fans, and Roman Abramovich, have clamoured for entertaining football since Ancelotti left, forever wanting to turn Chelsea into Barça-lite. This summer represents the perfect moment for Chelsea to take Sarri’s free-flowing, blue-shirted whirlwind of Sarri-ball from Naples to London.